Industry's First Smart Switch with 10G uplinks and stacking. Designed to provide 10 Gigabit connectivity to servers with superior performance, expandability and resiliency. Cost-effective solution for SMBs deploying Server and storage Virtualization. Industry's First Smart Switch with 10G Uplinks and Stacking An ideal companion to the rapidly emerging class of 10-gigabit servers, the NETGEAR® ProSafe® 52-port Gigabit Stackable Smart Switch is the industry's first smart switch with 10-gigabit connectivity - delivering maximum throughput in SMB networks for demanding tasks such as data replication and backup, virtualization, video on demand and high-volume transaction processing. At less than half the cost of a managed switch, the ProSafe 52-Port Gigabit Smart Switch provides 48 gigabit ports for connecting devices to the network, along with four 10GE SFP+ ports for stacking or uplink to servers. 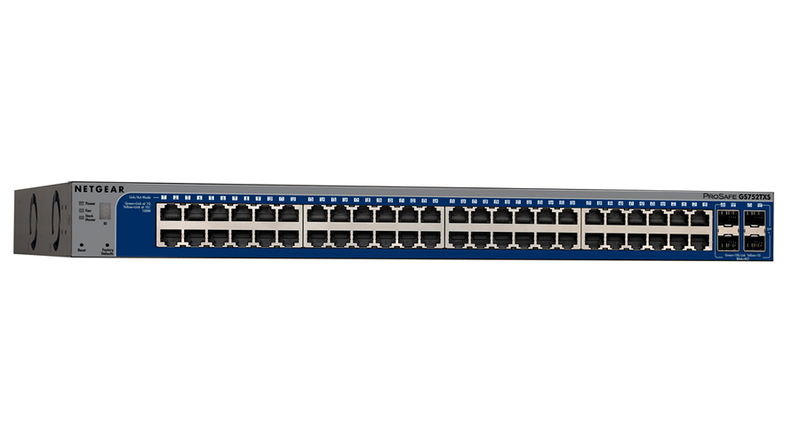 As many as six switches can be stacked for a total of 288 network ports, with full redundancy for unsurpassed reliability. The GS752TXS offers a rich enterprise-class feature set, including advanced traffic management and security, yet can be easily configured and monitored through a web-based graphical user interface. Enterprise-Class Features ith a rich set of Layer 2 management features, the GS752TXS is efficient, secure and ready for the future. Static routing allows for segmentation of the network, with internal routing through the switch - reserving the router for external traffic routing only, making the entire network more efficient. Dynamic VLAN assignment increases security by imposing consistent policy and user credentials across the network, regardless of where users connect. Support for MLD Snooping greatly increase network efficiency by forwarding multicast traffic to designated hosts only, rather than flooding multicast packets across all ports. The GS752TXS also comes with full IPv6 support, comprehensive security and advanced multicast management. Port 51 and port 52 can be used as the stacking ports or as uplink ports. Green Features: Lower power consumption during link-down or idle mode or with shorter cable length. 128Mbytes System DDR SDRAM (32Mbx16).